Medicine meticulously references various pharmaceutical boxes collected over the past few years. Some found on the street or discarded at the back of my local Chemist Warehouse, while others were purchased or prescribed to my family. 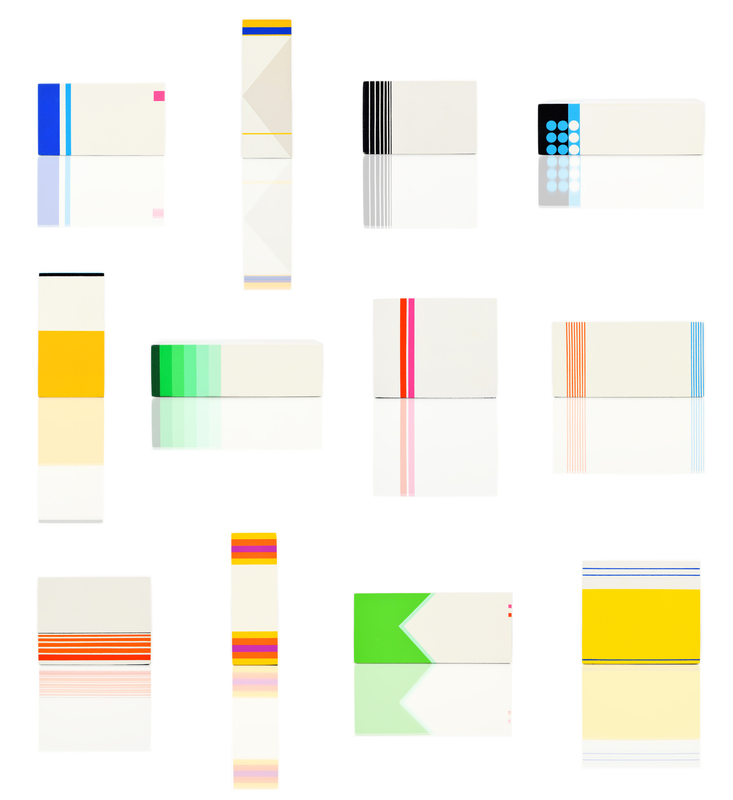 Stripped of all text and incidental imagery the work focuses instead on the abstract, geometric patterns that underpin the unique visual language associated with pharmaceutical packaging. These sculptures are made to the exact measurements of the original tiny medicine boxes. Medicine 2012-15, presents a series of four exquisitely made boxes. They are devoid of any text, yet the painted stripes and squares of pharmaceutical packaging are unmistakeable. These are reconfigured mainstream drug boxes – pharmaceuticals – the kind that you and I buy everyday at our local chemist. The accompanying gallery text confirms this with titles such as: 1. If Pain Persists; 2. Two Tablets Daily; 3. 24 Hour Relief; 4. Non-Drowsy. These are such familiar phrases that I can almost envisage the text written on the erased boxes – and even try to guess at which box fits which familiar brand. Elsewhere Atkins has used the term “readymade abstraction” to describe his practice of collecting and/or observing abstract forms in the world at large. He writes, “My work resides in a space between abstraction and representation…” A very apt description. There’s a warmth and a humour to this work, inviting us to look again at our ordinary pill boxes, now lifted out of their banal invisible existence to be invigorated with aesthetic feeling.